How long have you been volunteering with Cancer Focus NI? 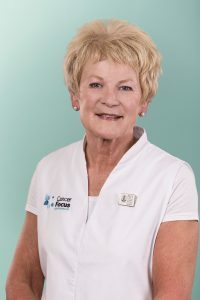 “I began volunteering with Cancer Focus NI, or Ulster Cancer Foundation as it was then, about 10 years ago after finding a flyer in my letterbox asking for volunteers for a driving service. As I’ve enjoyed driving for over 50 years and as I also enjoy helping people, I thought it was an ideal opportunity to combine the two. Both my parents died following cancer related illnesses over 30 years ago. All my working lift I’ve been in reasonably close touch with a very diverse cross-section of the public, of all colours, classes and religions (or none), and after retiring about 12 years ago I missed that regular interaction. What do you enjoy most about your driving role? The people I meet through my CFNI driving duties come from all walks of life, and are all in various stages of treatment. Without exception, all have expressed their appreciation for the driving service, as it removes one concern during a worrying time. You volunteer in many other ways – at outdoor events, fundraisers and in the office. What attracts you to the different activities? I think of my volunteering work with CFNI as my main hobby, and love to get involved in other activities as well as driving. So far I’ve helped out with marshalling at some outdoor events, supermarket bag packing, street collections, envelope stuffing, sun care bracelet making, manning information stands and lots more. Generally speaking, the more I can lend a hand, the more I am pleased. I get a buzz out of helping where and when I am able but, apart from the driving, I especially enjoy my other regular role which is servicing the collection boxes in various businesses throughout Bangor. In just over 2 years I have been able to double the number of local businesses taking our boxes – promoting the name of Cancer Focus NI and bringing in much needed funds. Several of the business owners now recognise me when I call to swap “a noisy box for a silent one” as I put it. I just love to uplift those noisy, heavy boxoes of small change. One business in particular has raised well over £4000 in two years and when I heard that figure a few weeks ago it gave me a great buzz. Other events I really enjoy helping at are the recent Run Mucker Run challenge in Ballymoney and the annual Comber Coffee Morning. How much time do you spend volunteering? I’ve no idea just how long I spend on volunteering, but whatever the length, it is time really well spent, and generally isn’t as much time as I’d like to spend. 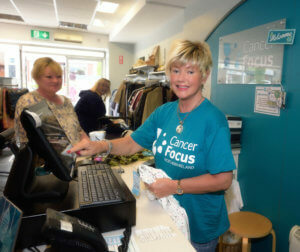 Volunteering with Cancer Focus NI is something I can heartily recommend to anyone even slightly interested. It is really lovely to meet up with, whether personally or on the phone, all the folk at the Eglantine Ave office, who I like to think of as my friends. They are, without exception, always very helpful, friendly and sharing. The same goes for the fairly rare occasions when I meet other volunteers, whether they be drivers or other volunteers in the office or at events. I may not always remember their names but I like to think they forgive me and allow me to call them my friends. 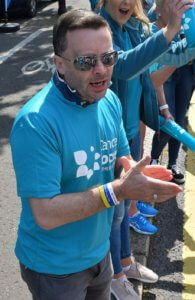 “Volunteering with Cancer Focus NI has been interesting, informative, challenging, satisfying, fun and much more! I get to work in areas which I think are important and I enjoy. I love being part of the team and it’s great knowing that I have Cancer Focus NI’s support, training and continuous guidance, which is crucial. Susan Johnston, from Hillsborough, is our lead Nail Bar volunteer. In 2012, Susan, a trained beauty therapist, approached Cancer Focus NI to ask if there were any volunteering opportunities in her field. Since then, Susan has been instrumental in establishing a weekly nail bar at the Cancer Centre at Belfast City Hospital so that women undergoing treatment have a welcome distraction. Liz Atkinson, our Head of Care Services, said: “Susan has become an invaluable part of our service. Her energy and enthusiasm shines through and all the patients speak so highly of her. Rohan Komatt, from Belfast, volunteers as a Leaflet Distributor, helping to increase awareness of the charity and our services in his local area. 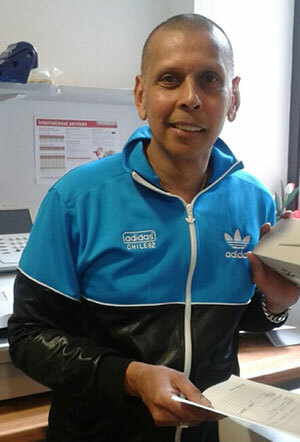 He said: “It’s a cause close to my heart as my own family has been affected by cancer – both my mum and dad had cancer – and this has made me more aware of its devastating effects and impact it has on families. This, along with the caring ethos of Cancer Focus NI, has inspired me to become a volunteer. 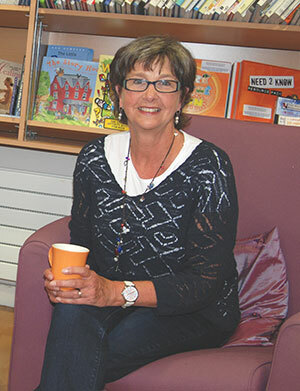 “As a volunteer for Cancer Focus NI, I’m involved in various activities. My present role as Cancer Focus NI Leaflet Distributor is an exciting opportunity to make local businesses, communities and the general public more aware of the charity’s work, to provide information on staying healthy and to promote Cancer Focus NI. I enjoy the involvement with the general public in creating awareness and know that in a small but significant way I’m helping people. “Working as a volunteer for Cancer Focus NI gives me the opportunity to meet and share ideas and information of my experiences with other volunteers. It’s also a way of making friends and bonding with people of different backgrounds and cultures. Cathy Hillock, from Lisburn, has been a driver with our Driving Service since it began in 2009. Cathy said: “I became a volunteer driver after seeing an advert in a newspaper. “I’d given up full-time work due to my own disability. I’d lost both my parents to cancer and I felt this was one way I could do something to help those who had no access to transport be attend their appointments. This means that patients can leave hospital as soon as they’ve finished their treatment without having to wait possibly for hours for hospital transport to take them home. “At first, I was apprehensive about driving patients with cancer to the hospital as I thought it might have been slightly depressing. How wrong I was – during my many drives I’ve shared lots of laughter with my passengers. They’ve shared their thoughts and I’ve heard about their families, and I’ve found many to be an inspiration. I love it because it is so different to what I did before and I’ve been able to catch up on some of my audiobooks going to and coming from the patients. Florence Young was inspired to help Cancer Focus Northern Ireland in the Lisburn shop whilst recovering from breast cancer – she wanted to give something back. 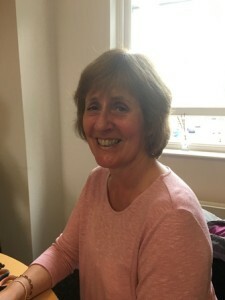 Alice Warde took early retirement in January 2011 and, while she enjoyed not having the daily commitment of work, she decided that she needed something to occupy her time. “I didn’t immediately rush into volunteering with any organisation but when I received the information from Cancer Focus NI, and they needed administration tasks completed, I decided to look in to it. “After my ‘getting to know you chat’ with Morag, the charity’s volunteer coordinator, I really felt at ease as she was able to correctly match my skills with the jobs that she needed done by a volunteer. I was shown around the building and quickly got to know all of the other staff who are always very friendly and appreciative. 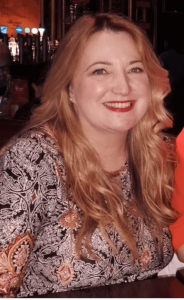 Claire Nicholls is a qualified Beauty Therapist and has volunteered with our Nail Bar Service in Bridgewater Suite, Belfast City Hospital, since May 2017. 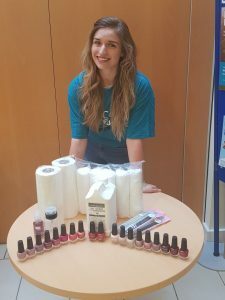 Not only does Claire give up her time each month but we want to say a big THANK YOU to Claire as she has also raised funds for the service that were used to buy nail polish, polish remover and other resources that we constantly need to maintain this complimentary service. All Cancer Focus NI services are free to the user so every £1 donated means we can invest more in providing a little luxury for anyone waiting for cancer treatments, and their companions. Dunmurry beauty therapist Nicola Connolly, who has survived two diagnoses of cancer, says that she wants to help patients by volunteering for Cancer Focus Northern Ireland’s nail bar service. “After seeing a Cancer Focus NI appeal for more volunteers on Facebook. I thought I would love to get involved. I set aside a few hours once a month for Cancer Focus NI at the City Hospital. It’s something I love doing. The nail bar is the perfect way I can help and it’s a fabulous little treat and a bit of craic for the patients. Over the months you also tend to meet the same people and feel a connection with them. Daniel Molloy makes a HUGE difference for Cancer Focus NI started volunteering as a retail assistant in 2015 in our Ormeau Road shop. This has led to employment with us as a ‘bank manager,’ working within all our shops wherever needed. Daniel is a remarkable volunteer and continues to help us at collections, bag packs and events. 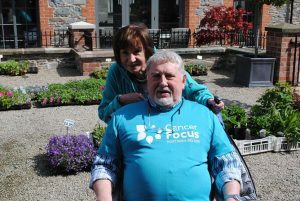 Peter Branker wanted to support Cancer Focus Northern Ireland to give something back after having had his own cancer diagnosis on three separate occasions. Peter has volunteered at events such as the Belfast Marathon, cycling events, street collections and most recently the Pink Run. 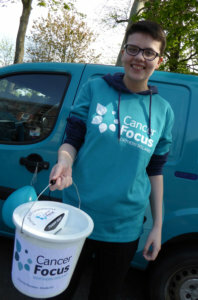 ‘I volunteer with Cancer Focus NI as I understand the importance of the work that they do. In years gone by the most important thing for someone diagnosed with cancer was to find appropriate treatments and hopefully a cure where possible, and there was very little focus on a patient’s wellbeing and other support they or their family and friends may require. I really love the fact that there is so much on offer to those affected by cancer nowadays and Cancer Focus NI is at the centre of this work, providing a wide range of support services. If our volunteers have inspired you to find out how you can help, fill in the form below or contact Morag Chambers on 028 9066 3281 or email moragchambers@cancerfocusni.org.